Ewwwww did you have to? I'm doing a double shift, so yeah, I had to. My brain is mushy at this point. Coffee can't help. Why do these people do this? If they want to have icons, why don't they do them right? Do they think they're improving on the traditional style? Can they not tell the difference? Oh good, I wouldn't want to incur her wrath. You are indeed doing well, Grasshopper. I only vent my iconophile wrath on those who deserve it. Why do people paint such travesties? Honest ignorance, pride, self-expression. The first is often correctable, the others much less so. San Juan Diego, father of the Mother of God, miraculously conceived in his womb, pointing to her as the Savior and Redeemer. Oy. "When I hear the words 'Interfaith Dialogue', I reach for my revolver." Unfortunately, the language of iconography does not give us such an explanation. LBK, you may have known his story, but just in case, I thought I'd post it. He is not trying to make himself look pregnant. That may not be his intent, but iconography doesn't see it that way. 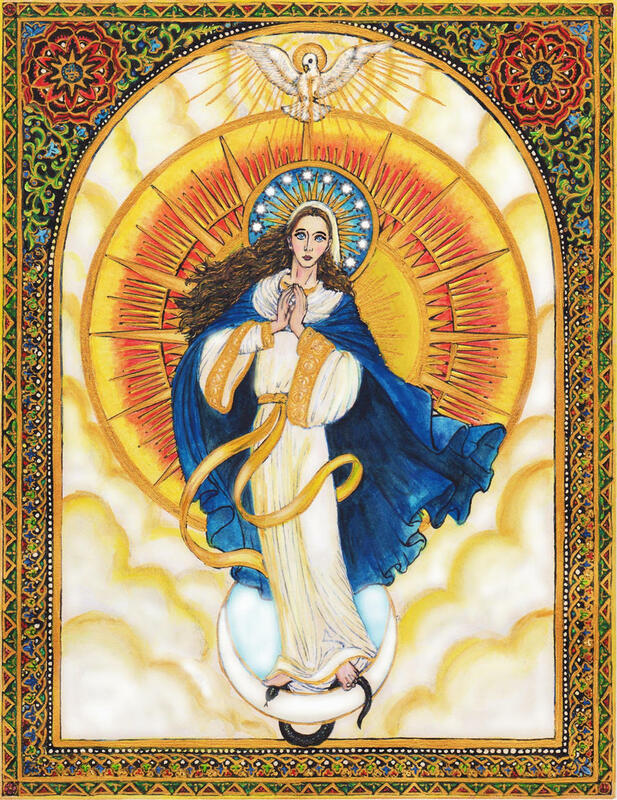 The Mother of God, surrounded by a mandorla, over his body, uses the same sort of imagery as the iconography of the Mother of God of the Sign, which speaks most clearly of the incarnational prophecy of Isaiah 7:14. This image still fails as an icon. Furthermore, it's from Monastery Icons, whose iconographic standards aren't exactly rigorous. When it comes to that, Juan Diego is from an Orthodox point of view a d*mned heretic, so there's not that much point to trying to impose Eastern iconographic standards on such an image. It seems that it is too much to ask that those who wish to paint icons, whether they are orthodox or not, are properly taught, not just how to put paint on board, but to have a thorough knowledge of the pictorial language and motifs used in iconography. Not everything painted in a stylized, non-realistic style is an icon. The forty-odd pages of this thread are testament to this. Which is why it's still schlock. Pride/ignorance. They don't want to really bother with the whole learning thing. Either that or they feel inspired that they are doing something brand new within the tradition. They're blind, so no. No matter how you slice it, they can't win. The Feast of Our Lady of Gaudalupe has been added to my Metropolia's calendar so there is a point. LBK how could the Image of Guadalupe be properly executed as an icon? People who are not Orthodox who paint icons diligently and seriously soon face the line in the sand: where adherence to proper iconographic principles encounters the dilemma of painting something which contravenes them. What is the meaning of the disembodied hand? It's a crop from a wider picture. I assume the hand belongs to St. Moses' dance partner. Just weird that you don't see any sleeve on that hand. Eleanor Roosevelt. It's more like a liturgical conga line. That's a prayer machine to all the angels? Is there an historically-explicable reason why there are not liturgical readings from the Revelation, by the way? What a strange question to put in the schlock icon thread. I have heard it was because of the potential for misuse and unhealthy speculation of the book. I think it was added to the canon too late to be included. There indeed ARE liturgical readings from Revelation....just that they are not usually done and are prescribed to be done at the end of a service that is not widely attended. I think it is listed in the (Slavonic) St. Sabas typicon. They are to be read I think starting after Pentecost for a period of time (don't remember - maybe Advent?) at the end of Matins. For those that want to research, I think it is somewhere in the first 60 pages. San Juan Diego, father mother of the Mother of God, miraculously conceived in his womb, pointing to her as the Savior and Redeemer. Oy. Icons and liturgy are not unrelated. The icons of Revelation are weird, too. That is not what is being represented. The Mother of God put her image on his cloak. How should we represent it? Unfortunately, the above image of San Juan Diego indeed speaks of what I expressed earlier. It's a prime example of someone putting paint to board without a thorough understanding of iconographic language and tradition. As this thread clearly shows, this failing is not restricted to those who are not Orthodox. 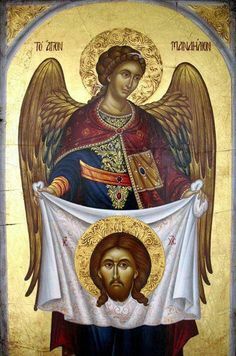 So when I see icons where two angels are holding up the Mandylion, that means the angels got together and conceived Christ? Oh the machismo in this forum. I guess it may be true what they say. no...because those ones are not suspended in 'robe form' over someones tummy...leaving in doubt if its a 'worn item' or a rendering of whats inside the person. leaving in doubt if its a 'worn item' or a rendering of whats inside the person. I don't know how anyone could genuinely see the icon of St. Juan Diego as him somehow bearing Our Lady of Guadalupe in his man-womb, especially if they know anything about the apparitions of Our Lady of Guadalupe and what St. Juan is known for. AHA....but there is the whole entire point. an icon, is supposed to, via itself, teach us or show us that story. I shouldn't have to know the story in advance in order to understand what is being conveyed. Yes, these days we can all read, so we often -do- know....but it was not always thus, and icons taught the story visually. If I have to know the story in advance to realize its not a man-womb, then the icon fails to teach or instruct. Which touches on an issue with icons in general, as much of the meaning/symbolism is easily lost on people. 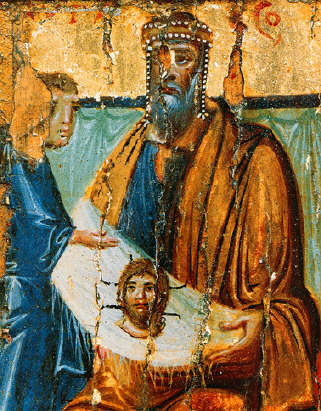 Take the icon of St. Veronica's veil, for example. If I showed my relatives that, they'd no doubt think that it was her holding Jesus' head (or some guy's head) on a cloth. And what about those stars/Greek letters/colors/etc.? All of those things must be learned, and cannot be understood without already knowing much of it in advance. Likewise, icons of eastern apparitions have the same issue of needing to know the story. In fact, I amusingly remember when I saw an icon of the Life-Giving Spring one of the first few times I even visited an Orthodox church. I thought it looked like some kind of juicer/blender or something.